OMGOSH... How CA-UTE Sherrie!!! Those are adorable Sucker holders!!! And yes... they are perfect for the lake as treats or for a B-day Party... endless possibilities!!! :) Have a Crafty Day!!!! Super cute birthday treat favors, they look so adorable! 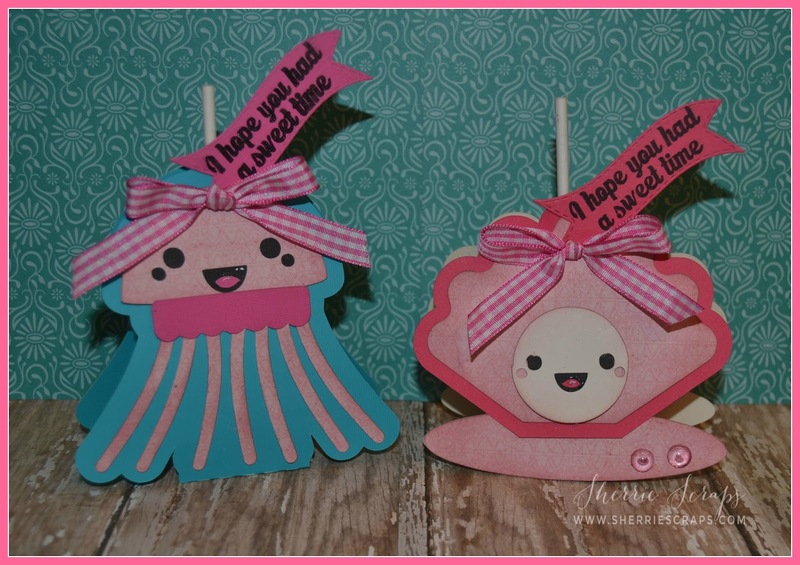 I love that you went to your box of scraps to make these cuties, they would be awesome for birthdays! Thanks so much for joining our Terrific Tuesday Challenge over at Scrappy Moms Stamps! These are adorable! I love them, so cute!!! 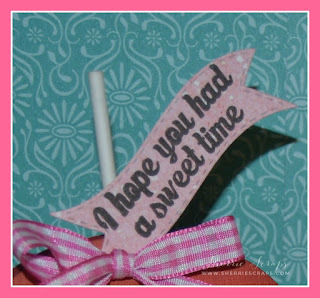 Like the added addition of the cute gingham bow and the cute sentiment! What a super adorable sucker holders!!! Great idea TFS!! Have a great day. Oh my gosh, so darn cute!! I love these, Sherrie!! Those faces make me smile!! I love the gingham bow you added!! I bet Arya keeps them all when she sees them!! They are so sweet and fun!! Awesome, sentiment, too!! They are super cute, way to go on those scraps!! EEEEEK - THESE ARE SO CUTE - SO AMAZINGLY, AWESOMELY CUTE!!!!! Love the fun details on them and just how clever these are!!! Love that you shared them with us!! Enjoy!!! So very glad you joined us for the Summer Fun challenge over at DoubleClick Skittles!! Some serious cuteness going on here! We are in full summer here... 117 already! So happy you joined in for our summer fun challenge! OMYGOSH!!! These are just ADORABLE!!! Perfect for a pool party!!!!!! These are so super cute Sherrie! Love each one! Thanks for playing along at Jaded Blossom! How adorable are these??? Love them Sherrie! Oh my goodness, what fun little sea critters! They are all so cute and hold a yummy treat. Great sentiment also, I love them all! 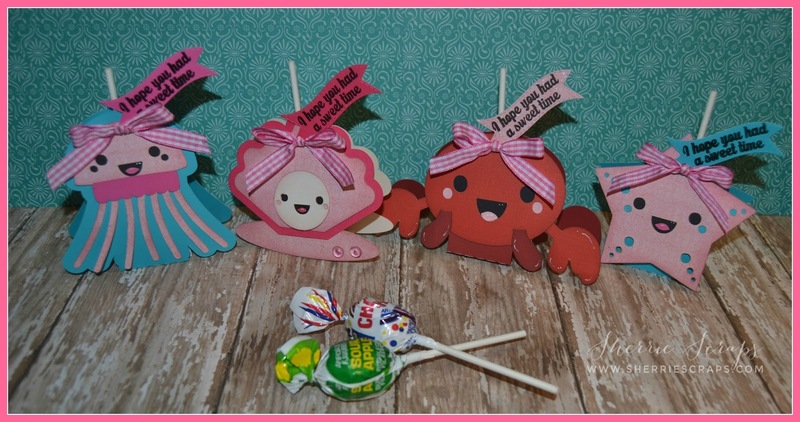 Perfect little sea creatures and yummy treats for the kids. Your sea creatures are just ADORABLE!! Such a fun sweet treat!! Oh! I just noticed the mini tags...Super CUTE!! FANTASTIC job with your sweet treats my friend, they are all sooo CUTE!!!!! Thanks for playing along at Jaded Blossom! So cute!! Thanks for joining us at Scrapping4Fun Challenges. Hope to see you again soon!! HUGS! Oh My Sherrie, I am Loving your Lolly Pop Treat Holders. That little Lobster is Adorable and makes me Smile. Have a Great Day! Ohhhhh these are soooo amazing and wonderful Sherrie ! I love , love , love each of these ! Sooo full of cuteness ! Aaaaawww, this is so cute! OMG how flippin' ADORABLE are these!!!!! So, so adorable!!! Perfectly sweet treat holders! Thanks so much for sharing them with us at Seize the Birthday! Sherri- these are just to darn cute. Thanks for linking up this month with Jaded Blossom. Adorable! Thanks for playing along in the challenge! Too cute. Love the faces. Would be a huge hit at any pool party. These are super cute! Thanks for joining us in the Jaded Blossom Challenge. 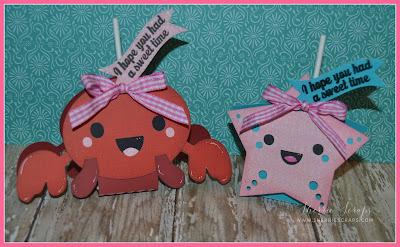 These are adorable little sea treats !! LOVE all things beachy !! Thanks so much for joining in the Jaded Blossom Challenge this month ! !